Washington, Nov 23: US Secretary of State Condoleezza Rice has indicated that Washington will still like Pakistan President Pervez Musharraf and former premier Benazir Bhutto to work together. "We obviously also still believe that moderate forces ought to try to come together to present a unified front against extremism," she told reporters here. 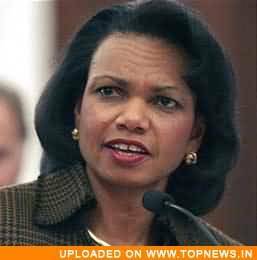 "Extremism is a problem in Pakistan," Rice added. Rice then named the two leaders who have been targeted by the extremists —Musharraf and Bhutto — and said that the attempts on their lives underline the need for moderate forces to work together. Asked what was the purpose of Deputy Secretary John Negroponte’s visit to Islamabad last week, Rice said that he went, first of all, to talk about how important it was for Pakistan to get back to the democratic path. She explained that democratic development includes freeing the media, developing the civil society and economic reforms. Pakistan was already pursuing these goals before the emergency rule was clamped on November 3, the Dawn quoted Rice, as saying. Rice also echoed the sentiments President George W. Bush expressed in a television interview on Tuesday when he said that Musharraf has done more for democracy in Pakistan than any other modern leader has. She credited Musharraf for putting Pakistan on a road to greater realisation of these goals, and said: "Look, a lot of that was done by Musharraf himself. And so for him at this point to help put his country back on the road to democratic reform is important." Rice said that it’s very clear what the US expects Musharraf to do.